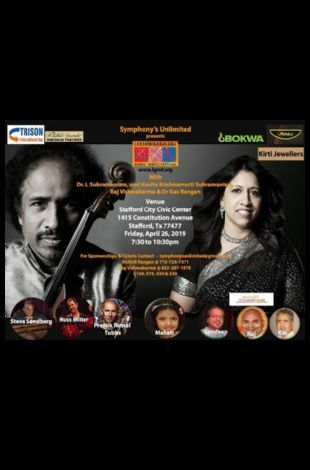 Symphonys Unlimited in association with The Lakshminarayana Global Music Festival brings to Houston a one of a kind mesmerizing evening of fusion music. Padmabhushan Dr. L Subramaniam The God of Violin & Padmashri Kavita Krishnamurti Subramaniam in concert with World musicians Steve Sandberg (three time Emmy-nominated composer/pianist), Russ Miller (multi-platinum recording Artist, played on multiple Grammy award winning recordings), Premik Russell Tubbs (composer, arranger, producer and an accomplished multi-instrumentalist) along with other world musicians performing for a charitable cause, to raise funds for M.J Fox Parkinson's Research. 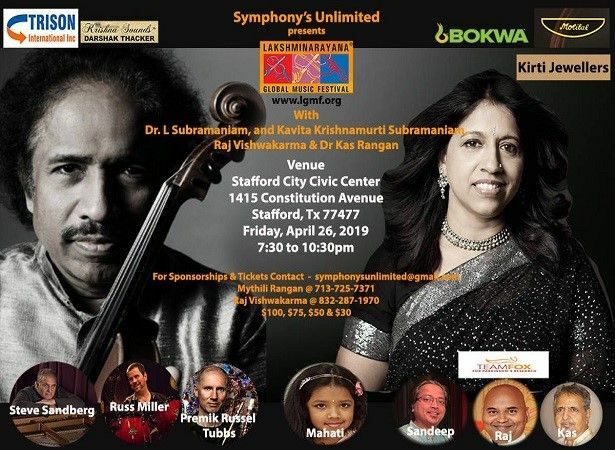 Also performing will be Houston's local artist Raj Vishwakarma, Sandeep Kumrouth, Selva Ganapathy and Dr Kas Rangan along with little diva Mahati, granddaughter of the Subramaniams.